Harriet C. Hyde writes on behalf of Miss Constance Holt, who is ill with bronchitis. Berry had misunderstood Holt's offer of a Victrola to be the offer of a radio. 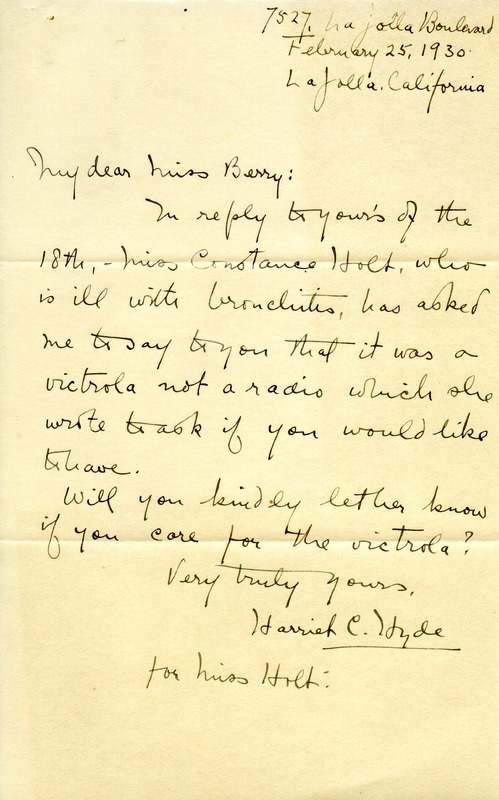 Hyde writes to clarify the matter and see if Berry would like to have the Victrola. Harriet C. Hyde, “Letter to Martha Berry from Harriet C. Hyde.” Martha Berry Digital Archive. Eds. Schlitz, Stephanie A., Sherre Harrington, et al. Mount Berry: Berry College, 2013. accessed April 19, 2019, https://mbda.berry.edu/items/show/12953.